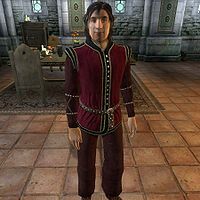 Tertius Favonius is an Imperial commoner living in the Imperial City's Elven Gardens District with his girlfriend, Romana Faleria. When he's not wandering about the Imperial City, Tertius likes to hang out at the nearby King and Queen Tavern. Tertius also occasionally travels to Bravil; while there he stays at Silverhome on the Water. He is one of four distributors of the Black Horse Courier newspaper. Tertius wears a set of middle class clothing: a burgundy linen shirt, burgundy linens and a pair of quilted shoes. He also carries his house key and a small amount of gold. Tertius seems to be quite involved in his relationship with Romana, as he will greet you with: "Tertius Favonius. Romana and me have set up housekeeping. She's a real doll, isn't she?" When you ask him about the Imperial City he will be rather forthcoming about his past but he also makes it clear that he has changed by telling you that: "I like the ladies. It's been my weakness. But now I've got Romana, I stay away from the fleshpots." Like Tertius, Romana will also often talk about her partner when you approach her: "Isn't Tertius a dreamboat? I'm Romana Faleria. I'm such a lucky girl." When you ask her about the Imperial City she will reveal that she knows about Tertius' past with the ladies: "It is SO hard to find a man you can trust in this big city. Sure, Tertius has had his share of girls. Just look at him. But all that's changed now."